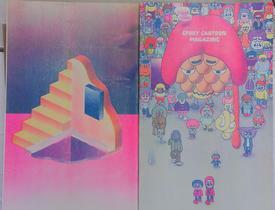 Hold onto your hats, Epoxy Cartoon Magazine is a one-of-a-kind, mega-sized, 11" x 17", hand-constructed risograph. 14 of its 16 pages are full-page, poster-esque quasi-prints, with varying degrees of sequential content, while the centerfold consists of a series of Jay and Kay comic strips. And there's more! Hand bound into this issue are: a fold out two-sided diagrammatic "World Map", one side in line art, the other fleshed in with color and tone; a line art post card of the back cover image; and... actual die cut stickers and "back issue postage stamps"! We managed to get a few more of these than the other Epoxy issues, but it still qualifies as a limited supply by any definition. 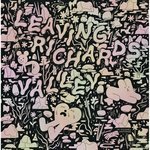 PLEASE NOTE: We plan to be extra careful in packing these fairly fragile oversize works, and so are charging a bit more to ship them. GONE AGAIN! We'll try to get it back in stock, so please check back.